Newsletter #784: The "Make It an Event" Issue | Andy Sernovitz | Damn, I Wish I'd Thought of That! 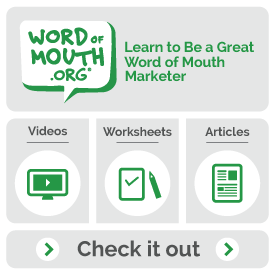 When you’re launching something new, you can earn a big word of mouth bump by giving your biggest talkers the first taste. In prep for the launch of their new spicy chicken sandwich, Chick-fil-A is taking reservations for exclusive taste tests. A week before the sandwich officially hits the menu, fans can RSVP for special tasting sessions at local franchises. More than just a mass giveaway, the exclusivity of the tasting sessions helps fans feel like real insiders part of something special. The lesson: Get your biggest talkers involved in your new product launch by inviting them and their friends in for an exclusive taste test before it’s publicly available. Throwing an event that benefits a great cause — and that’s a lot of fun — can earn you a bunch of buzz and new fans. AXE is starting conversations with their Undie Run Challenge. The event challenges 10 college campuses to see who can donate the most clothes for charity by inviting them to strip down to their skivvies, donate their clothes, and run through campus. It’s a simple event for a great cause that’s going to create a lot of buzz for participants and onlookers alike. The lesson: Give people a reason to show up and bring their friends by partnering your event with a worthy charity. Get people to show up year after year by creating a holiday that’s worthy of becoming a tradition. Three Floyds Brewing Company, a small craft brewery in Indiana, hosts their annual Dark Lord Day festival. In addition to trying beers, eating BBQ, and enjoying live music, Dark Lord Day is the only day of the year you can buy Three Floyd’s Dark Lord Russian Imperial Stout. The beer is consistently ranked as one of the top beers in the world and its ultra rarity only adds to its popularity: Tickets to this year’s festival sold out within two hours. The lesson: If you’ve got a limited supply of your best stuff, try hosting an exclusive event that helps your biggest fans come together to celebrate it. Grooveshark is a fantastic site for listening to music online. The music library is huge and you can create playlists that you can save and share with friends. While Pandora is still great for discovering new music, Grooveshark is the place to go when you know exactly what you’re looking for.